As the year 2014 comes to an end it is time to look back and reflect on the garden once again for another year past. 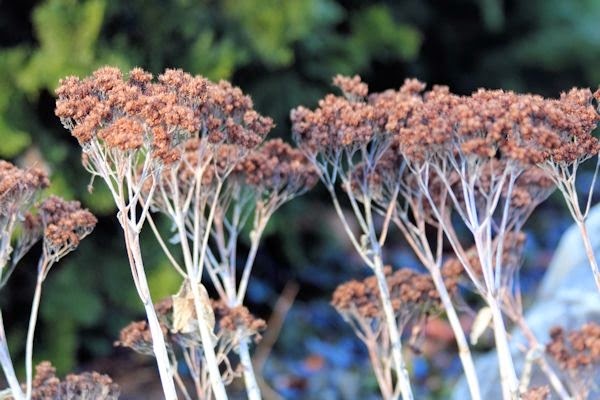 Overall, 2014 was a good year for the garden but it didn't start off as any ordinary winter. The first month of 2014 came in like a lion with winter storm Hercules on January 2nd. bringing a foot of snow and 10 degree F temperatures, followed by torrential rains and a warming trend...and that was just the beginning! 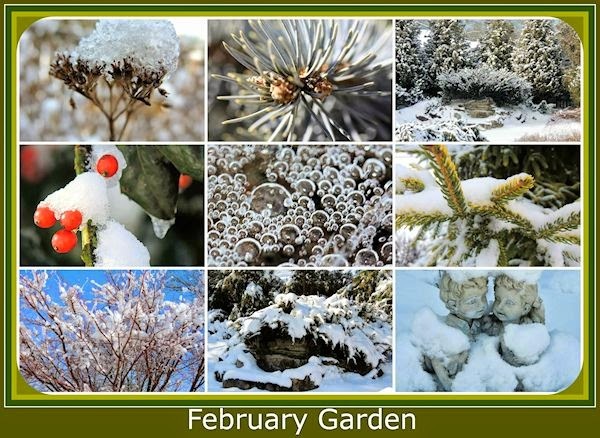 By the time February rolled around we had already endured six snowfalls and the gardens were covered in a blanket of winter white. There was a stillness in the landscape with the sound of crackling in the background as ice fell from tree branches and the temperatures were so frigid that the snow and ice remained. The bark of the Coral Bark Maple glowed a pinkish hue under the snow for up to a month and a permafrost covered the gardens, yet the glistening ice was a beautiful sight to behold. I worried a bit about the gardens but knew they would be insulated by the snow until the temperatures rose. 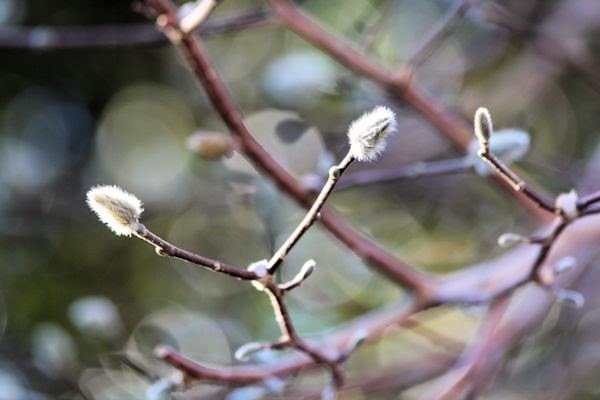 The month of March continued with snow flurries and winds but the winter that seemed would never end slowly started to disappear with each passing day. The daily temperatures started to rise into the 40's and 50's after a seventh snow storm and frigid temperatures beforehand. The temperatures could not seem to stabilize and plummeted once again into the 20's right around mid-March. After the last biting cold there was a sight for sore eyes...the very first robins had arrived! On March 31st. we had our last snow. Spring at last...spring at last!!! 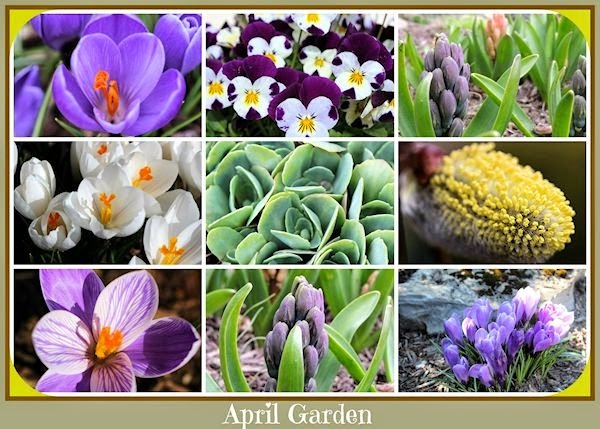 April arrived with temperatures in the 50's and lower 60's with crocus and hyacinth bulbs making their appearance with their colorful blooms now awakening from a dormant sleep. For a while I didn't think they would ever appear but the last five inches of snow had melted quickly by the next day and the cold was gone. It was starting to look a lot more like spring and the blooms were appreciated more now than ever. 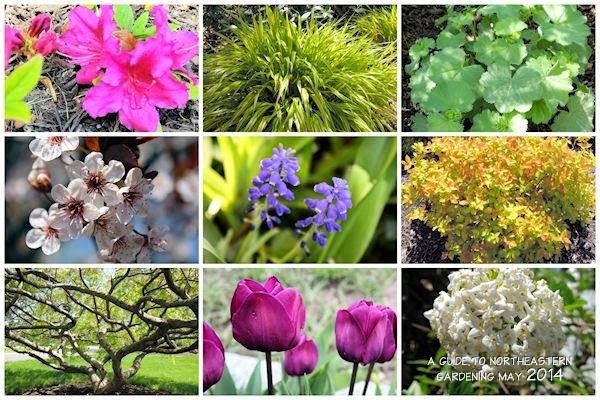 May arrived with tulips, grape hyacinth, azalea, spirea, viburnum and Thundercloud Plum blooms and at last and the gardens were full with color. 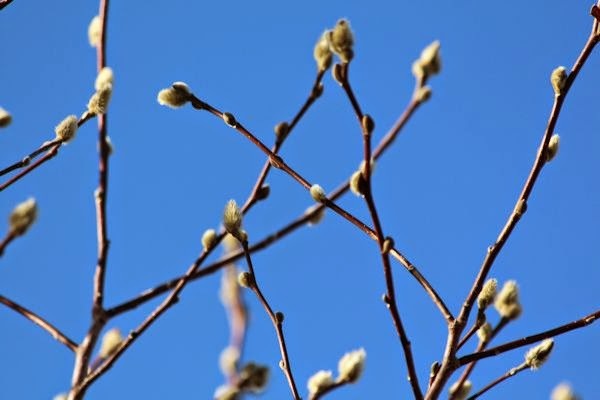 The temperatures had elevated into the 70's and even hit 82 degrees one afternoon, allowing buds to burst into wonderful blooms. Despite some winter damage on my hydrangea and Crape Myrtle, everything else in the garden weathered the harsh winter just fine. Now in retrospect there can be something said for a bitter cold winter with abundant snow. The June blooms were the most vibrant I could remember, or maybe I was just so happy to see them...either way I was content! The temperatures had finally worked their way up into the mid to upper 70's with a couple of days soaring right up into the 80's. 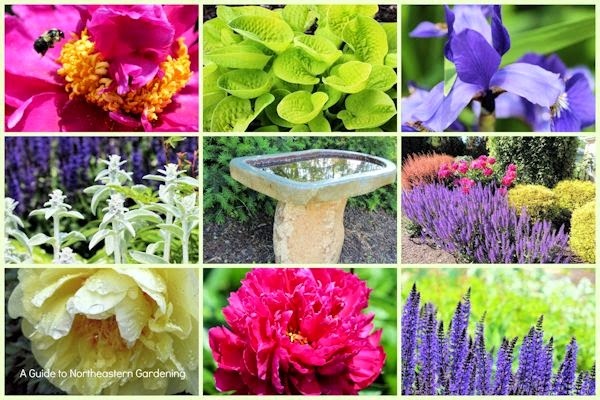 Spring had sprung and the gardens were putting on quite a display of color with roses, peony, salvia and iris. My newest addition to the garden in June was Paeonia 'Bartzella', which you can see in the photo above (lower left corner). I instantly fell in love with this plant with its beautiful yellow petals. Almost every day in July was dry with clear blue sunny skies and much cooler temperatures than normal, staying in the low to mid-80's throughout the month. My hydrangea had suffered from the cold after all with no blooms this season but the Tardivia Hydrangea on the side of the house made up for all the others. 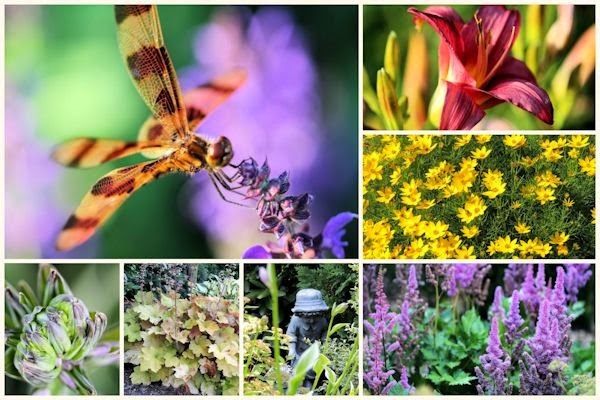 The Crape Myrtle also came back with a full set of blooms starting in late July while blooms of salvia, coreopsis, astilbe, daylilies, heuchera and hosta were abundant throughout the month. All the memories of a horrendous snowy winter gradually faded from my mind. The month of August remained on the cooler side with temperatures in the lower to mid-80’s, unlike days in the upper 80's and 90's like in previous years. On August 13th the drought was relieved with what seemed like a monsoon dumping 13.25 inches of rainfall which was the highest recorded rainfall we have seen here on Long Island in 500 years. 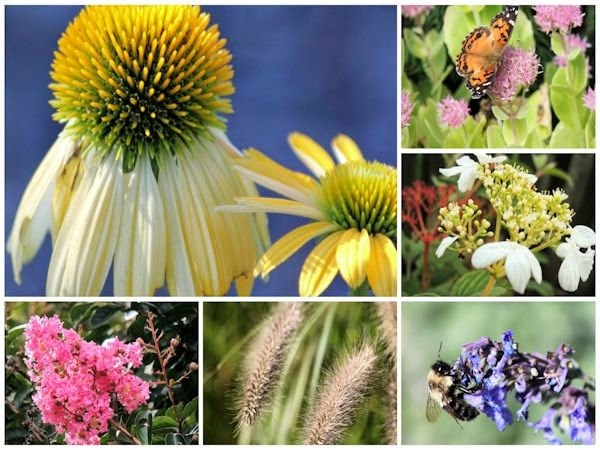 The long period of drought was over and the gardens became rejuvenated with blooms. New additions to the garden this August included Echinacea 'Cheyenne Spirit' and Heucherella 'Buttered Rum', both which added much color to the garden. September ended up having some of the warmest days of the summer during the first week with humid days and temperatures in the upper 80's. 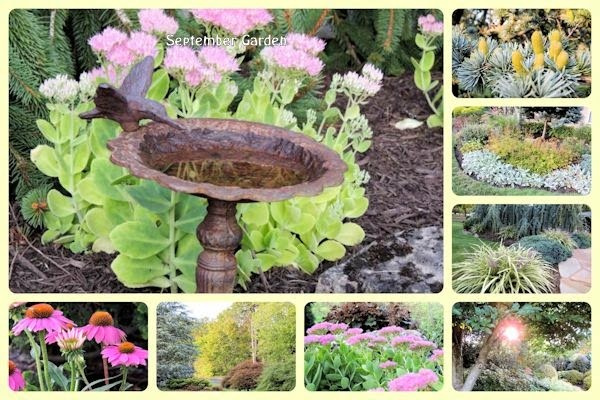 The garden continued as if it was in summer mode and more blooms arrived such as fall blooming sedum and liriope which joined the already blooming echinacea. These blooms eventually became the highlights of the garden. As the month went on temperatures regulated themselves and dropped into the 70's. October signaled the end to summer as temperatures dropped into the 60's with nighttime temperatures in the 50's and a there was a sudden briskness in the air. While the leaves were falling the blooms did keep on coming. We hadn't had the high temperatures from summer that usually take a toll on some of the flowers. 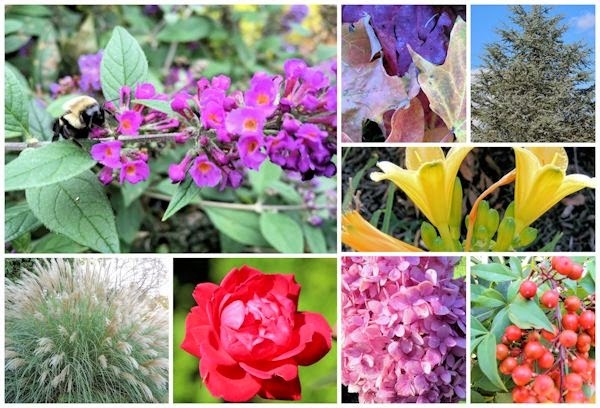 October continued to produce blooms to this gardener's delight! In November the chill in the air became a little more prominent as temperatures dropped into the 50’s by day and into the mid-40 by night but overall it was a milder November than I can remember from the past. 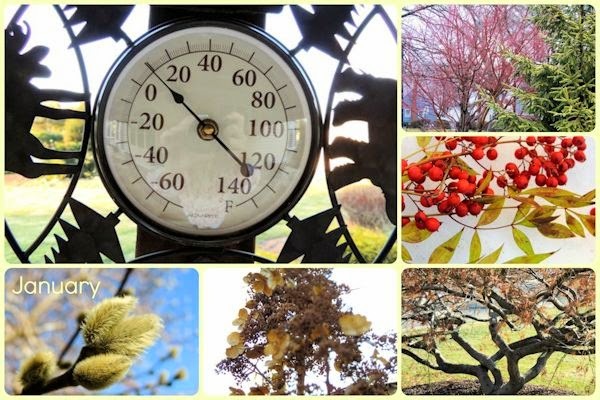 The continuation of milder than usual temperatures extended the gardening season well into the fall. December came in with some blustery and cold temperatures in the 30’s and 40’s and now the time had come for the garden to go to sleep. 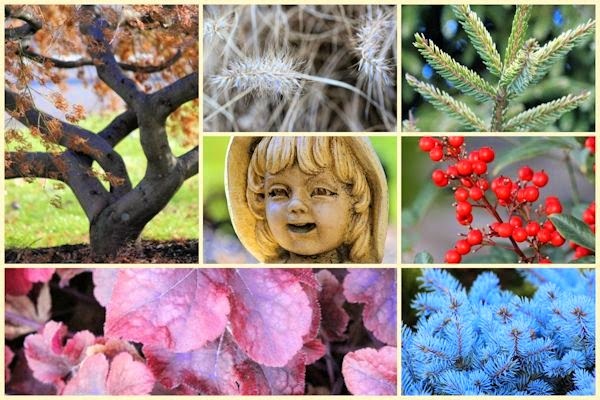 It was a good growing season overall with lots of blooms followed by a beautiful and rather mild fall and a normal December temperature wise. Our first snow arrived mid-December but was just a dusting that disappeared the next day with some flurries here and there. It was a sign that winter is here, and as the garden sleeps this gardener dreams of next season! 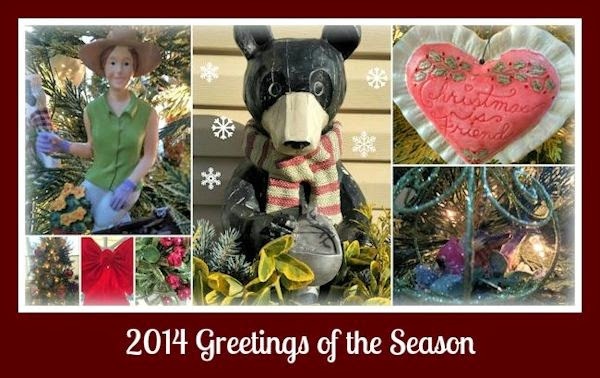 Hope you had a wonderful 2014 season and I look forward to all your gardening stories in 2015! Linking with Today's Flowers, Floral Fridays, Mosaic Monday at Lavender Cottage and Helen at The Patient Gardener’s Weblog. At this time of year with holiday cheer, decorations, glistening lights and the hustle and bustle I often reflect on the year gone by. As I get older I have realized that I have a deeper appreciation for the things in life that cannot be bought...good health, happiness, formed relationships and the wonderful feeling of warmth one gets when surrounded by close family and friends. I appreciate my passion of gardening and overall it was a good year. The upcoming post will be on on the 2014 year in review! I have realized that I have gained a finer appreciation for nature and the inner beauty it possesses...paying closer attention to the smallest of detail. I guess part of that comes with experience and age and the other part from participating in macro photography memes and from viewing your beautiful photographs, many which have been inspiring and meaningful. 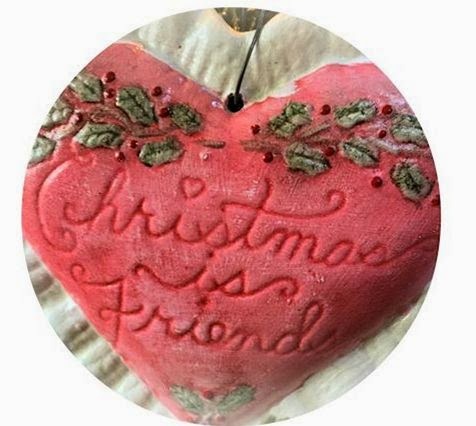 I also know that I am thankful for having the opportunity of communicating with others who share the same passion as I do, following your latest gardening endeavors and sharing ideas through the virtual world, many of which have made me learn, laugh, smile and often think deeper. GREETINGS OF THE SEASON FROM OUR HOME TO YOURS! 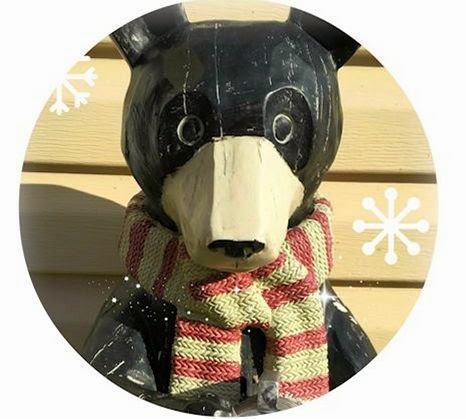 At this time I would like to wish all my readers Happy Holidays and a very Merry Christmas! I hope the spirit of the season brings you joy and good memories of time spent with family and loved ones. May you experience happiness, good health and prosperity throughout the upcoming year and always. All the best to you and As Always...Happy Gardening! One week away from the official start of winter the days have been blustery and cold with temperatures in the 30’s and 40’s and it is time for the garden to gradually go to sleep. 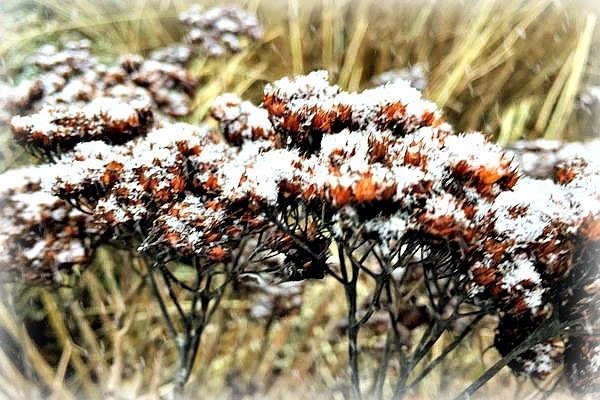 It was a good season with lots of blooms followed by a beautiful and rather mild fall and now the snow has arrived with more on the way. There are gentle reminders of blooms from a summer gone by with signs of what is to come in the next season. 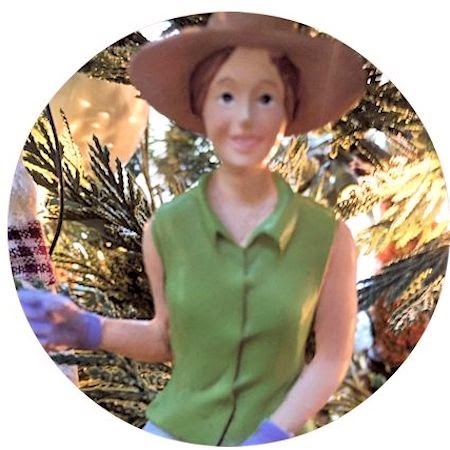 Come take a stroll with me in my December garden…better bundle up…it’s cold outside! 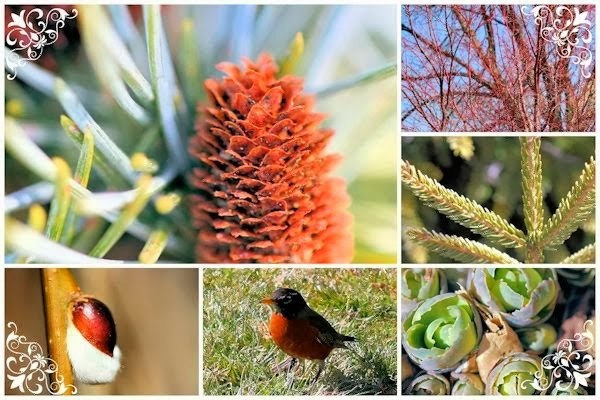 Since the winter is almost here and blooms are done for the season it is a time to focus on the structure and detail in the garden. 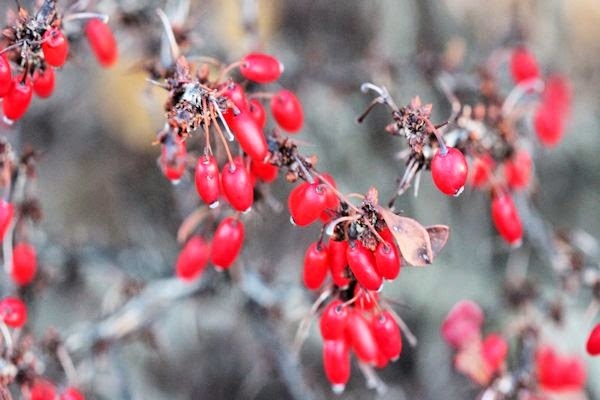 I like to incorporate whatever color I can such as barberry which displays bright red berries that show up nicely in December and throughout the rest of the season. We're getting a real close up here! 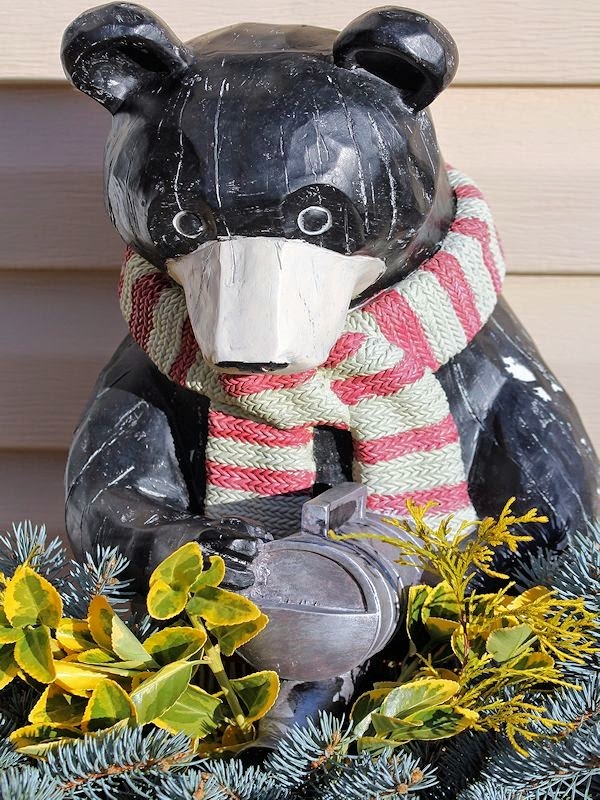 Here is "bear" who I purchased a couple of seasons ago and he is sporting his freshly cut greens at the door entry for visitors to see. 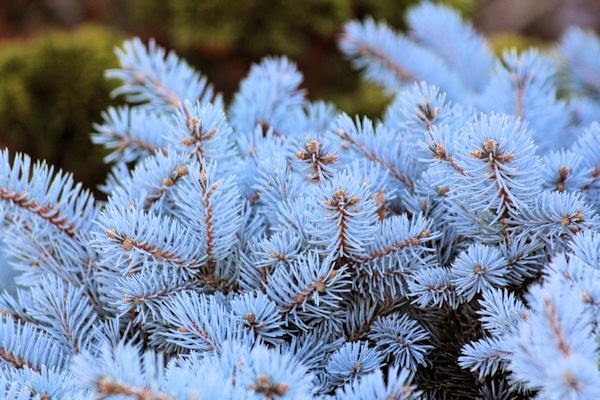 One of my favorite evergreens in the garden is globe blue spruce for its bright blue foliage. 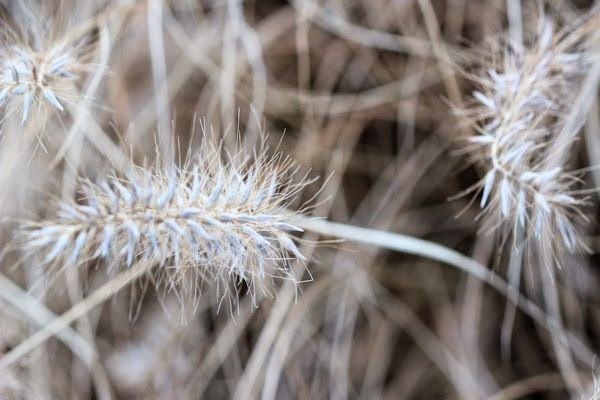 I also enjoy it for the bottle-brush like structure of its needles. 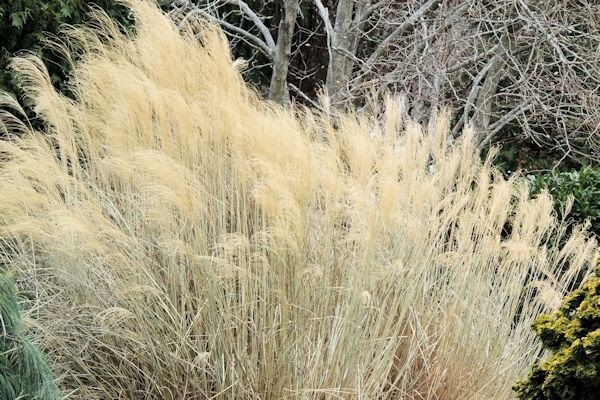 The ornamental grasses are asleep for the winter. When photographing the plumes they appear to be black and white with the lighting (no photo editing here)! This is the first winter season for my new Nandina domestica which replaced the previous plants lost during construction. They are producing their winter berries nicely. This is giving a little bit of a different take on things. 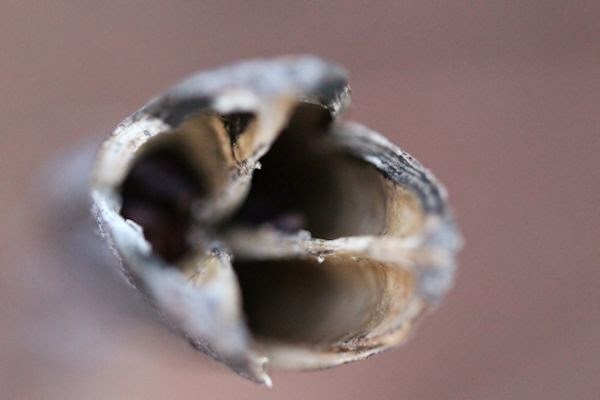 We are getting a glimpse of this Japanese Iris seed head looking down from above and photographing it macro style. In an attempt of getting more creative with the various lenses I am striving to capture the intricacy of nature's artwork. 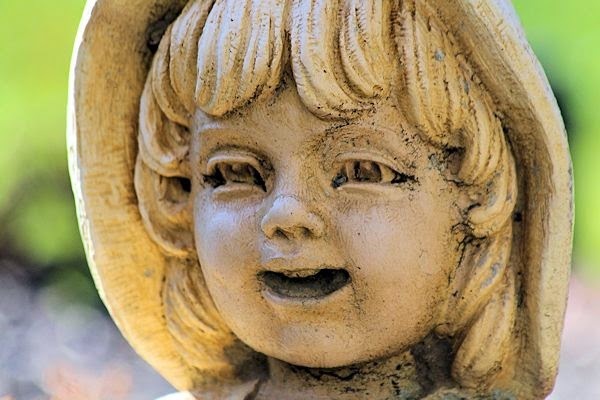 Here is a little more macro-mania with a close up and personal with Garden Gal! I purchased this Skylands Oriental Spruce in 2008 when it was six feet high and it has doubled in size, just about reaching maturity. 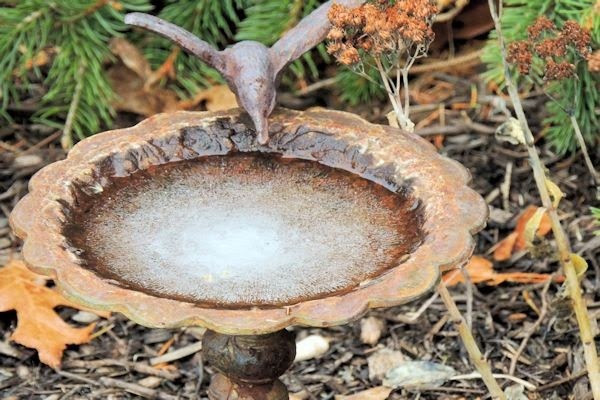 It is one of my favorite pieces in the garden. You have probably seen the full tree in previous walks and since the focus here is on detail let us look at it real close up! 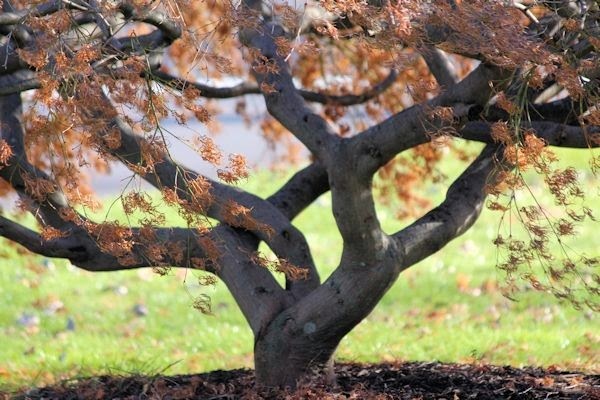 The foliage of the weeping Japanese Maple is just about all fallen so you can see the structure of the twisted trunk beneath the canopy. and will continue to enlarge as the season goes on. I hope there isn't too much in the way of a deep freeze that could do damage to next year's blooms. 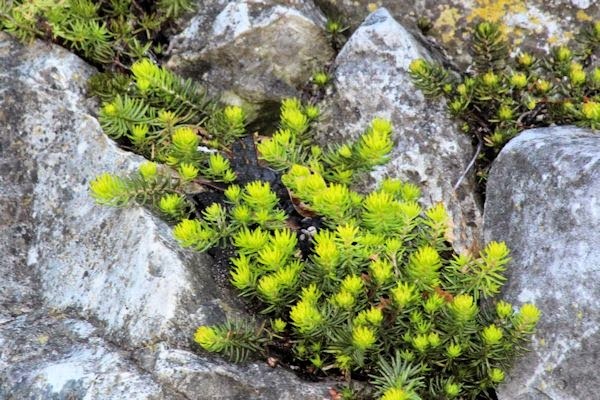 and the Sedum 'Aurea' tucked in between the crevices of the waterfall will stay semi-evergreen throughout the winter. Welcome to Heucherella 'Buttered Rum', the newest addition to the garden at the end of the summer. 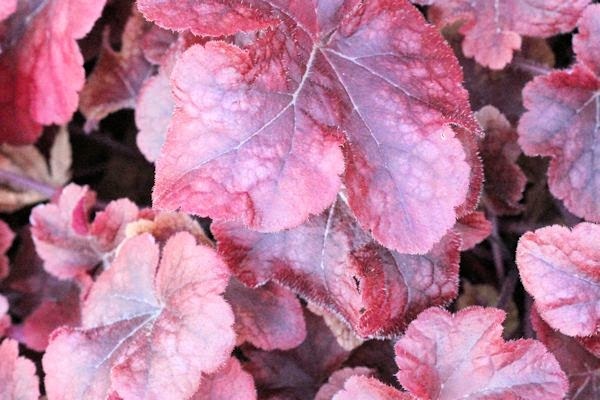 'Buttered Rum' is a new hybrid combination of a Heucherra and Tiarella and turns this deep burgundy-red in winter. 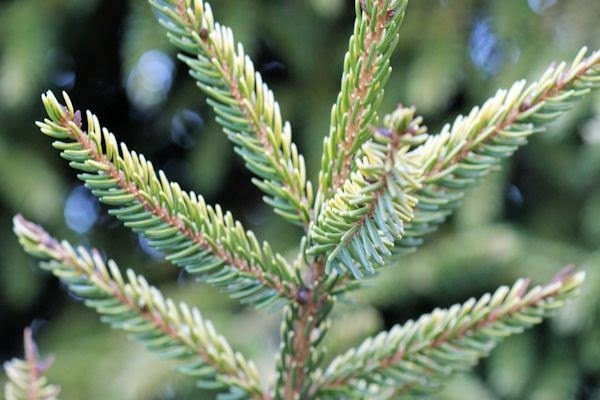 It is also supposed to be an evergreen! and there is a definite chill in the air as we come to the end of our walk. I hope you enjoyed the walk through my December garden. 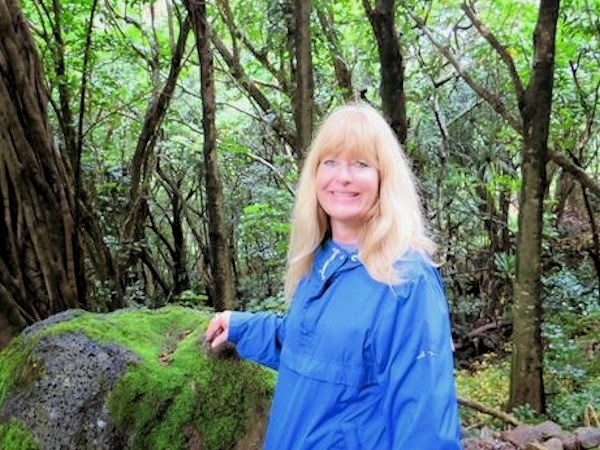 Please visit our hostesses Carol at May Dreams Gardens for Garden Bloggers' Bloom Garden Bloggers' Bloom Day and Pam at Digging for Foliage Follow-Up. 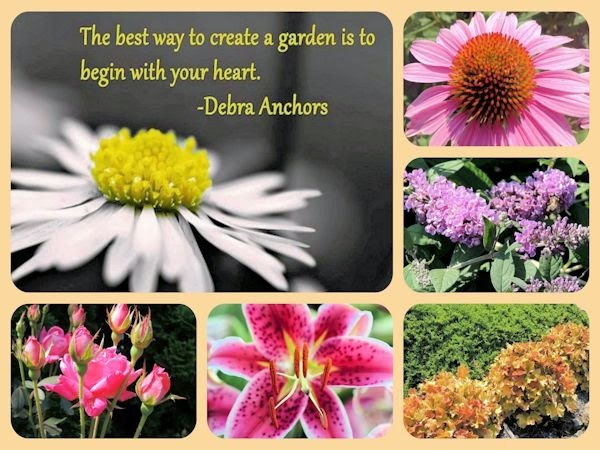 I am also linking up with Creative Country Mom's Home Sweet Garden Party, Today's Flowers, Floral Fridays, Mosaic Monday at Lavender Cottage, I Heart Macro and Macro Monday 2. Thank you so much for visiting and if you leave a note I will know you dropped by to say hello and I will be sure to visit you as well! 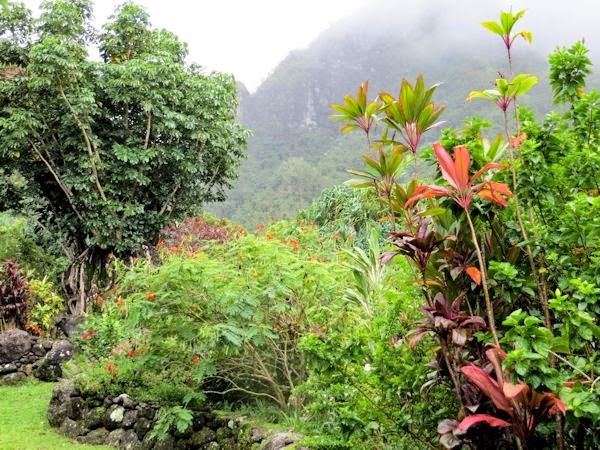 Welcome to the beautiful Limahuli Garden on the north shore of the island of Kauai. 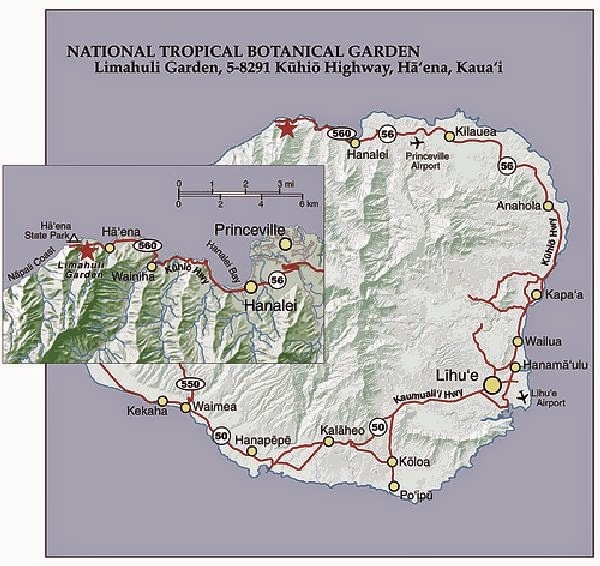 Limahuli Garden and Preserve is one of the National Tropical Botanical Gardens, located in the 1,000 acre Limahuli valley and the home to nearly 250 taxa of native plants and birds. 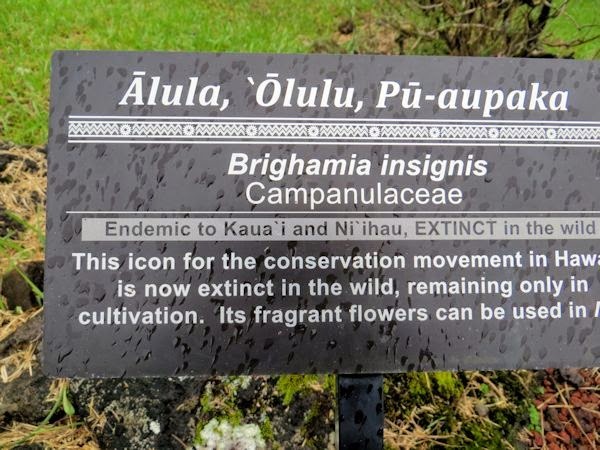 Out of Hawaii’s 1200 native plant species about 114 are already extinct and approximately 50 or less individuals of the 300 native species are remaining in the wild. 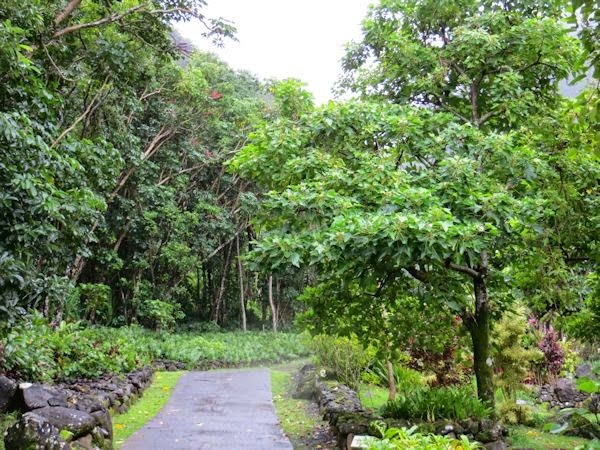 Mostly all of the native plants in the Limahuli Gardens are extremely rare and known to be endangered. 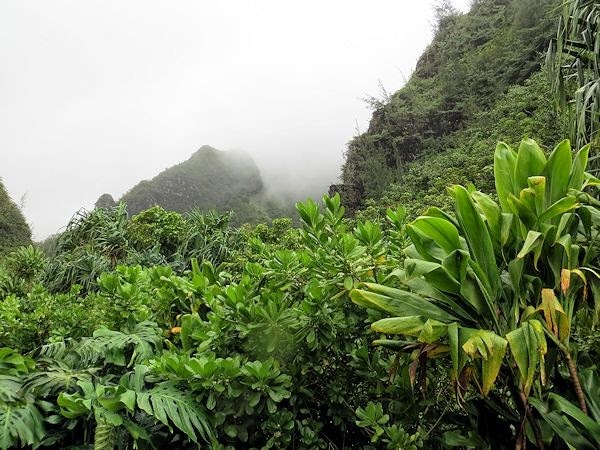 The mission of the National Botanical Garden is to preserve the Limahuli Valley and its ancient Hawaiian plants in their natural setting and save them from extinction. 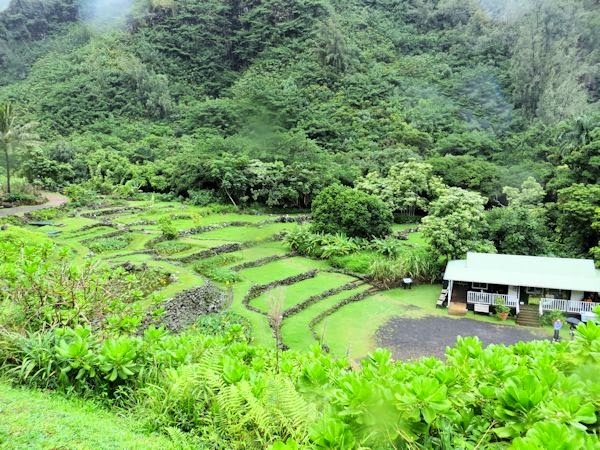 On a recent visit to the island of Kauai I had the extraordinary pleasure of observing and learning about the history of these gardens first hand…an amazing and unforgettable experience! 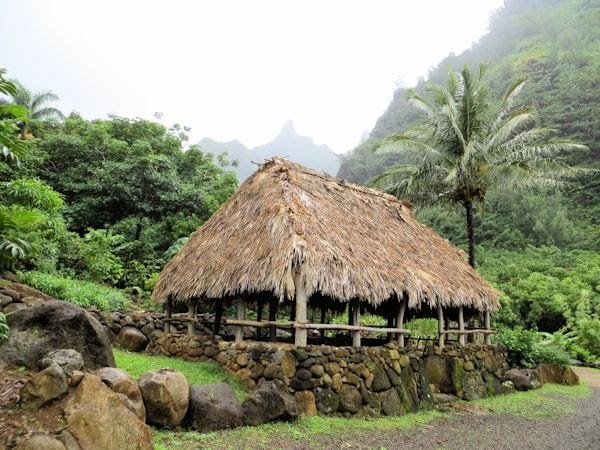 Surrounded by majestic Makana mountains and lush tropical rain forest the culture of the ancient Polynesians is preserved through this traditional Hawaiian hale house that was reconstructed on the footprint of an ancient house site in a 2013 restoration project led by cultural elders. 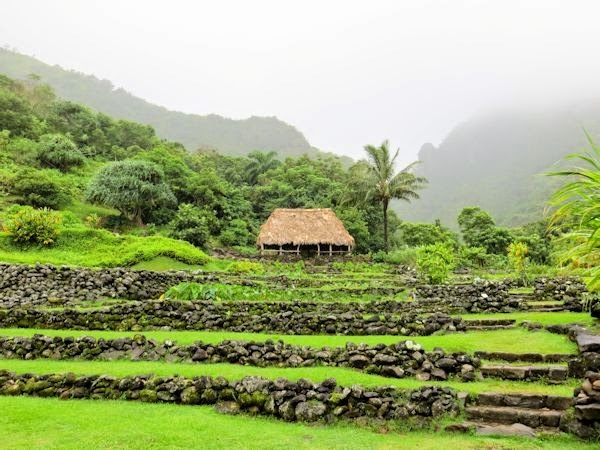 The ancient Hawaiians constructed the hale house of tropical resources which were and still are very abundant, thus respecting and protecting the forest community of the Limahuli valley. 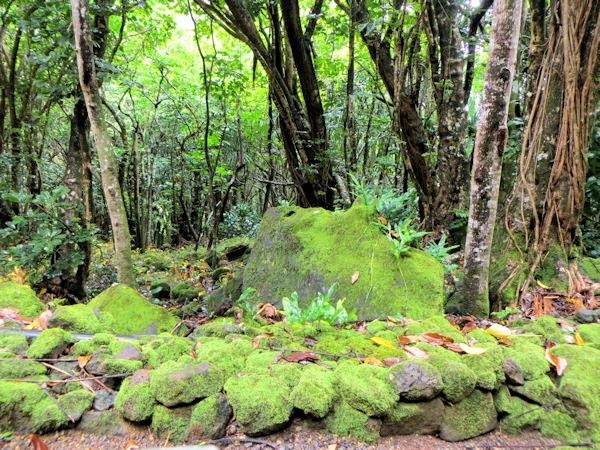 Throughout the gardens are also lava rock terraces that were built by Limahuli's early inhabitants. 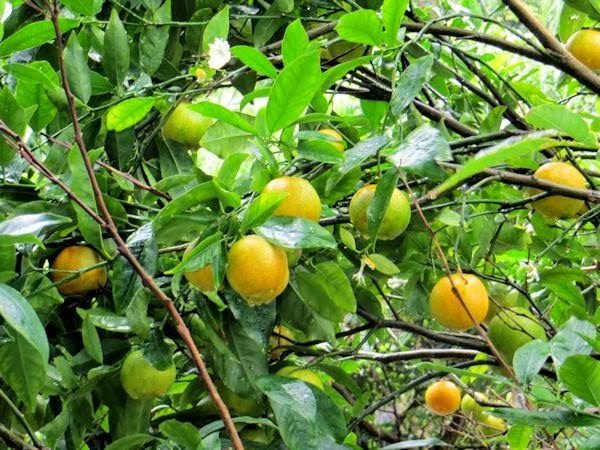 Known as Mandarin Orange in other parts of the world, Citrus reticulata (Tangerine) was brought to the Hawaiian Islands in 1825. 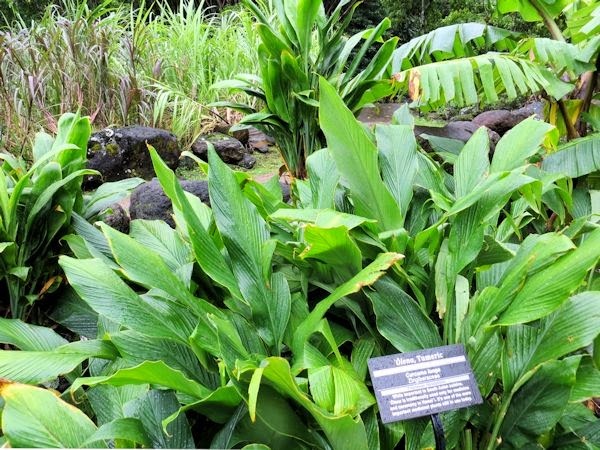 Olena (Tumeric Curcuma longa) is important in Asian cuisine but was traditionally used for medicine and ceremony in Hawaii and is still used in medicine today. Bird of Paradise Strelitzia reginae. Bird of Paradise (Strelitzia reginae), an iconic symbol of Hawaii is neither native nor introduced by Polynesians. 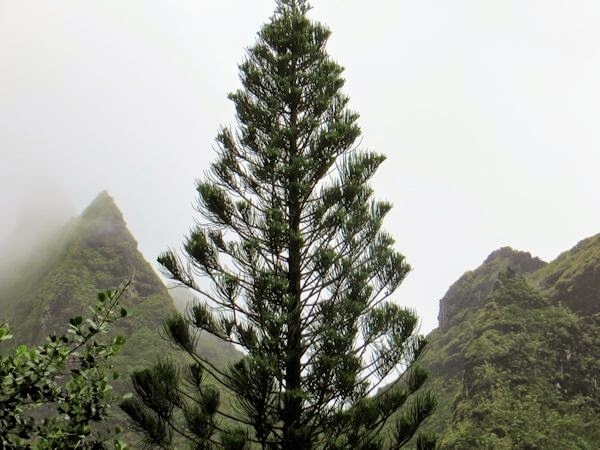 It came to Hawaii in the 19th century as an ornamental. 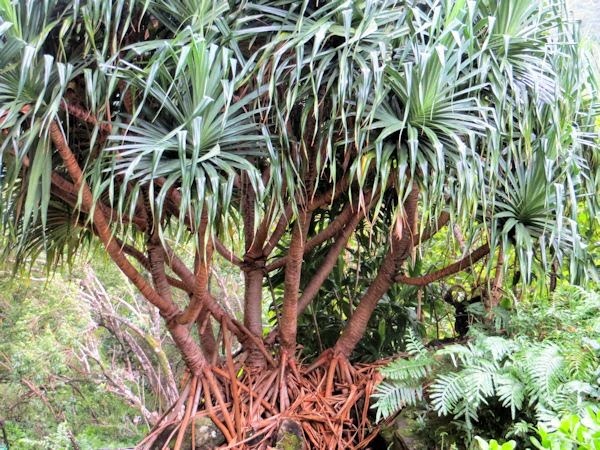 Cordyline fruiticosa (Hawaiian Ti Plant) was considered to be sacred by the early Hawaiians and the symbol of high rank and power. It was worn or carried in ancient ceremonies as protection from evil spirits and is still used today in modern rituals. 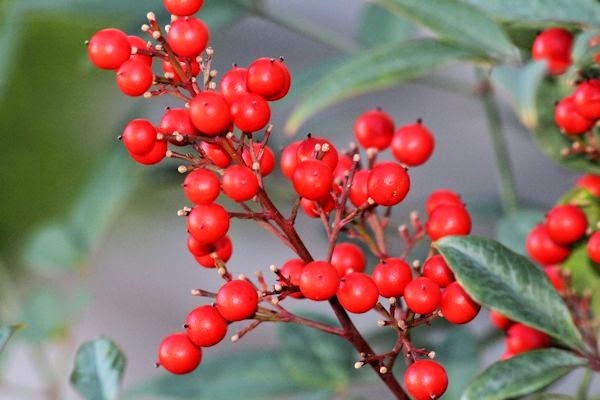 It's waxy leaves repel water and have many uses. In cooking they are used as a wrapper for storing and cooking food, in building as thatch for housing and in clothing for sandals and rain gear. 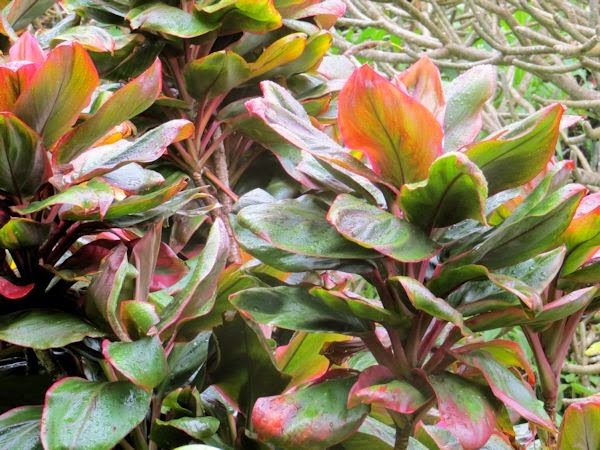 Red varieties of Ti have been introduced to Hawaii and hybridized to produce many beautiful foliage colors and are reproduced from seed. 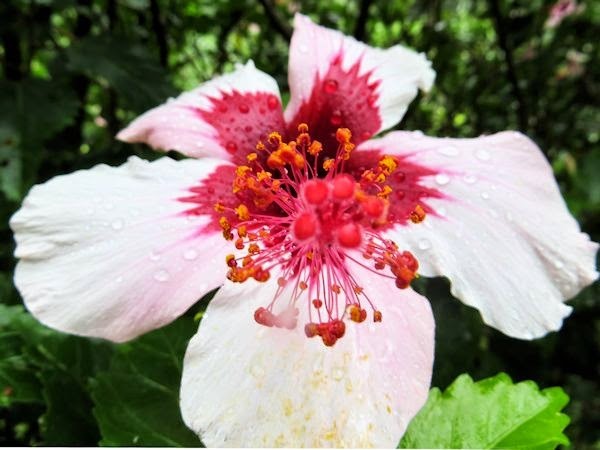 Hala is a native plant of Hawaii as discovered in 1993 when a preserved haha branch dating back to 1.4 million years ago was discovered in a broken lava rock near Hanalei Bay. 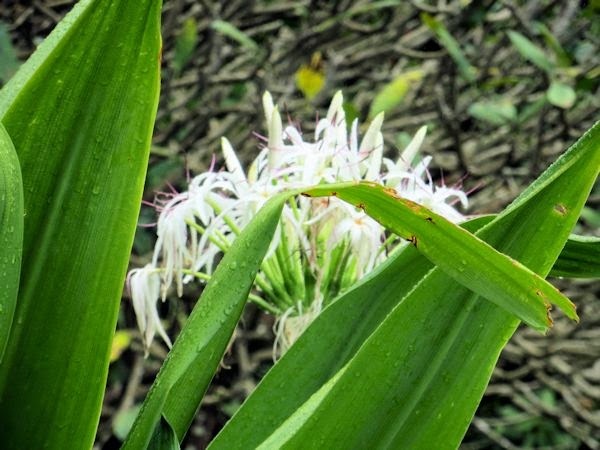 Native Polynesians also brought over Hala to use for weaving into mats, baskets, flooring and pillows and also for the sails for their canoes. 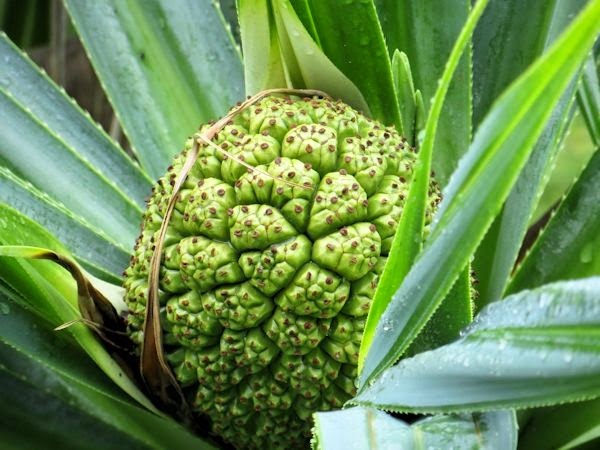 The female Hala plant produces a fruit which resembles that of a pineapple. When ripe the cluster of fruit breaks into separate fleshy parts that were known to be eaten during times of famine. Limahuli Stream is a freshwater source beginning at the top of the valley at 3,330 feet (1,015 meters) above sea level and plummeting over an 800-foot (244 meter) waterfall before reaching the valley floor and continuing to the ocean. 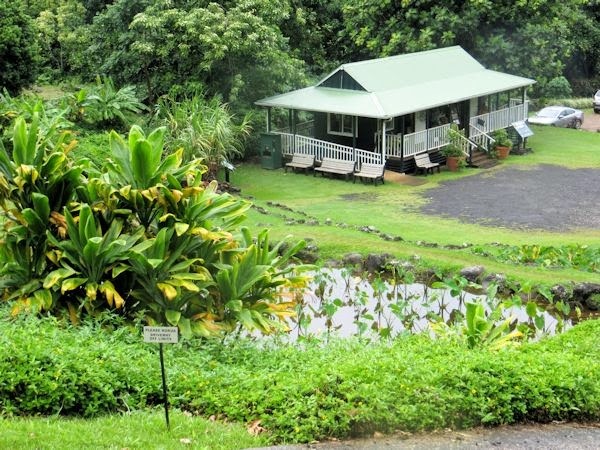 Many unique animals and plants live in the Limahuli Stream including all five species of Hawaiian freshwater fish. 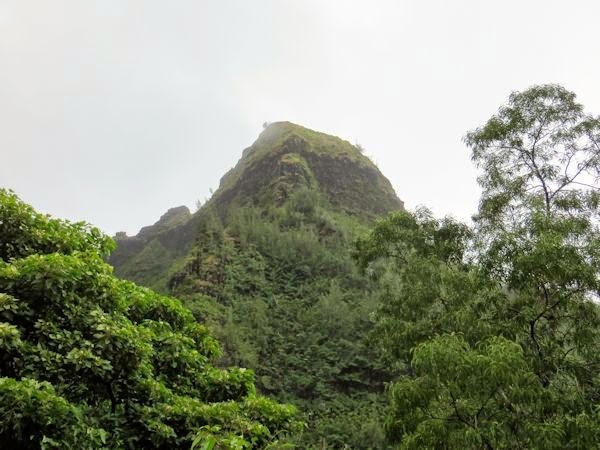 The value of freshwater to the Hawaiian culture is expressed in their language with wai meaning "fresh water" and lani being the word for "heaven,sky"; hence Wailani=heavenly water. 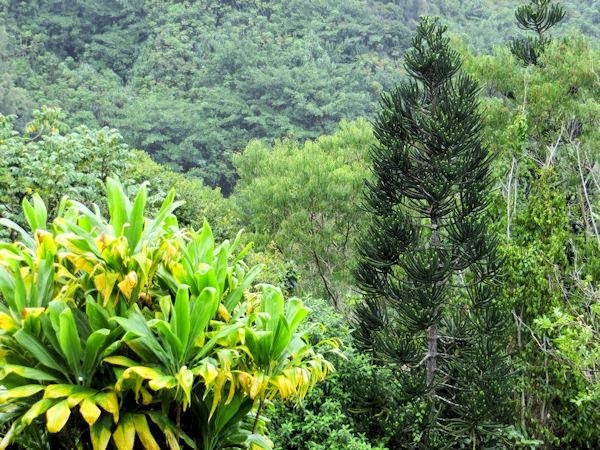 Araucaria columnaris (Cook Pine) was introduced into Hawaii as a landscaping and lumber tree and is the most common Araucaria species in Hawaii. The striking foliage on these trees resembles that of a Norfork Pine but finer and more wispy...just beautiful along with the mountains in the backdrop. 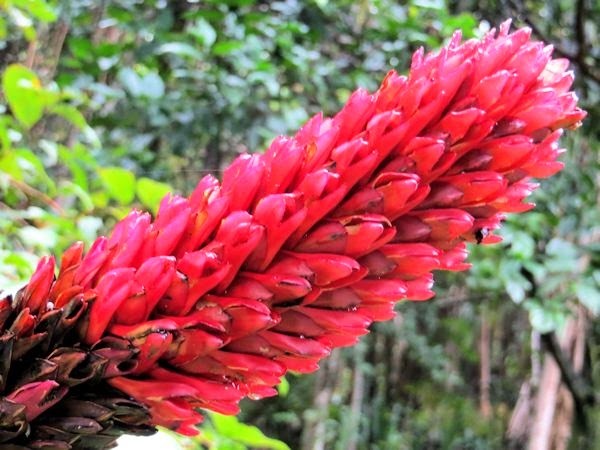 Alpinia purpurato (Tahitian Red Ginger)was an introduction to Hawaii and is one of over 1,300 species of ginger that can be found around the world. Each flower is actually a clump of red spikes that grow out of the end of a long, leafy green stalks that can grow up to 6 to 7 feet in height. 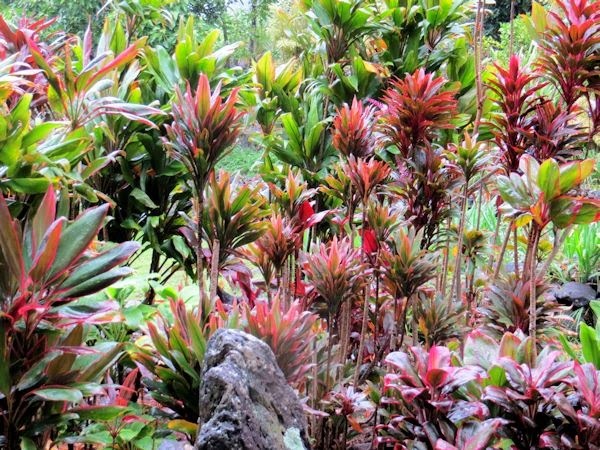 Red Ginger are not edible but are great as a cut flower and can be found in many Hawaiian tropical flower arrangements. 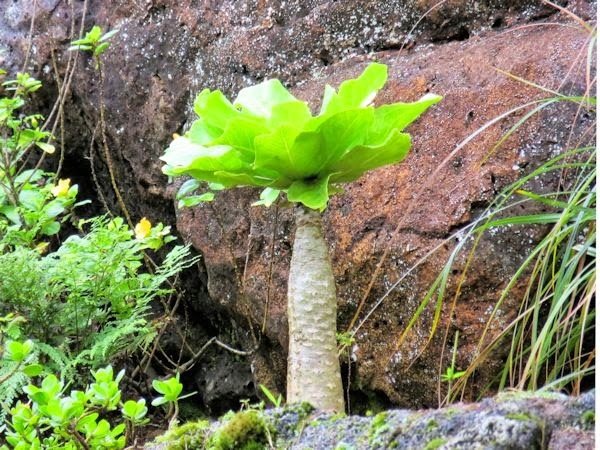 Alula is an unusual, almost prehistoric looking plant that is native to Kauai and extinct in other parts of the world. 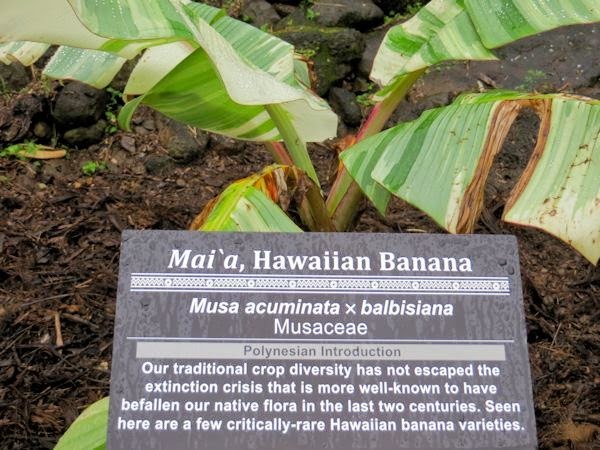 Once found on the windswept sea cliffs of Kauai, Alula suffered a serious decline in population from Hurricane Iniki destroyed half the natural population along the NaPali Coast in 1992, leaving only one remaining growing in the wild. According to the U.S. Botanic Garden, the only pollinator for the plant was a now extinct "hawk moth". Alula can now only produce seed when artificially pollinated by humans. 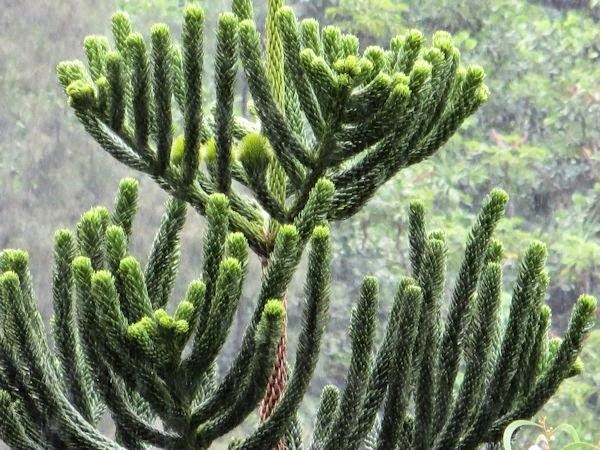 Thanks to conservation efforts, the endangered Alula has been preserved in National Botanical Garden's Limahuli Garden and Preserve, saving the plant from extinction. 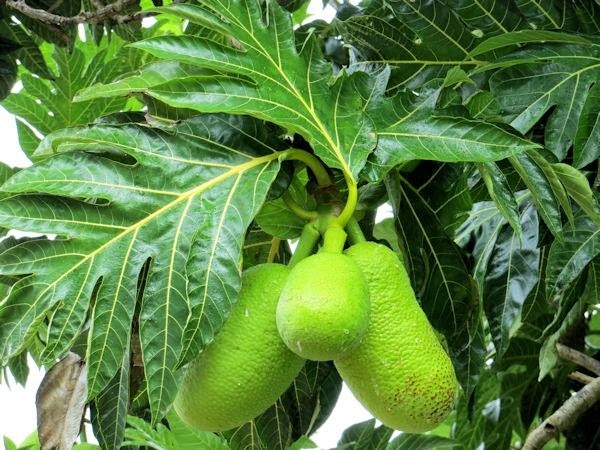 Originating from the South Pacific, Breadfruit or Ulu, as it is named in Hawaiian, was one of the few life-sustaining plants the Polynesians brought with them when they sailed to the Hawaiian Islands. The fruit and seeds of all three species are edible and very nutritious filled with vitamin B, calcium and complex carbohydrates. When cooked the taste of breadfruit is described as potato like or similar to freshly baked bread. Ulu turns into a sweet and gooey fruit when very ripe but is more nutritional when unripe. 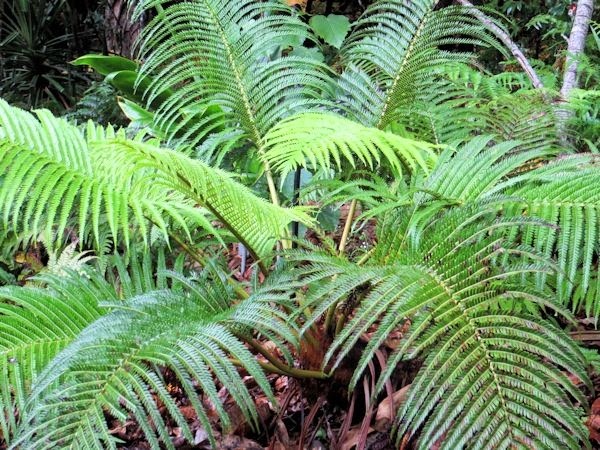 It also has many other uses as it has played a part in the making of construction materials, medicine, fabric, glue, insect repellent and animal feed. 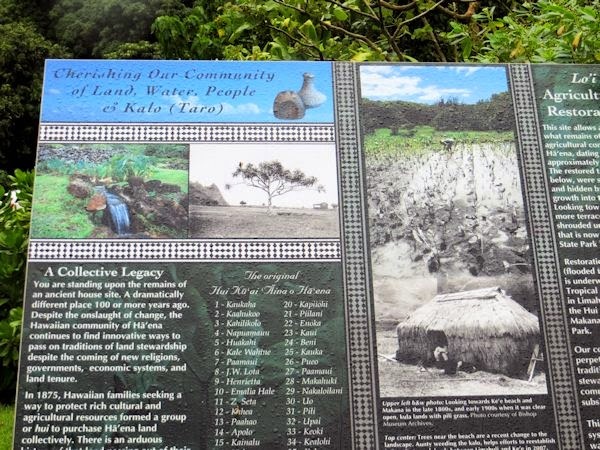 Ulu is known as the "tree of bread" in Hawaii. Here we are back at the visitors center. 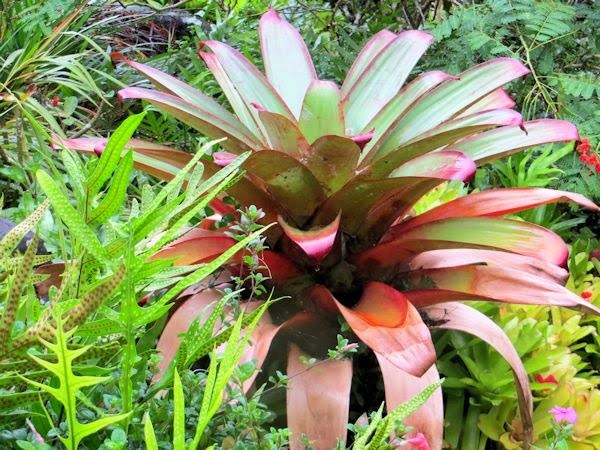 If you are in the area of the north shore of Kauai be sure to give these magnificent gardens a look. The views of the gardens are amazing and the staff are wonderful and very helpful. 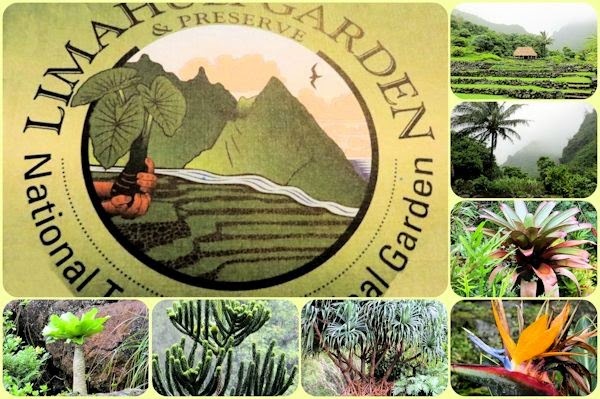 Limahuli Garden was selected by the American Horticultural Society as one of the best natural botanical gardens in the United States and has both self guided and guided walking tours available Tuesday through Saturday 9:30-4:00 pm. 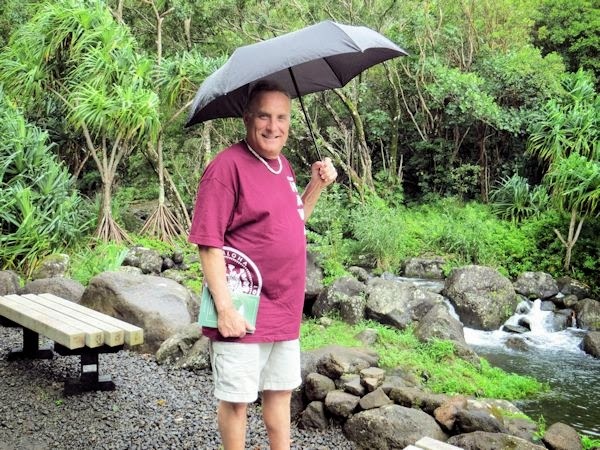 Since it is the windward side of the island and a tropical rain forest chances are it could be raining so bring rain gear just in case and enjoy! I hope you enjoyed the virtual tour. 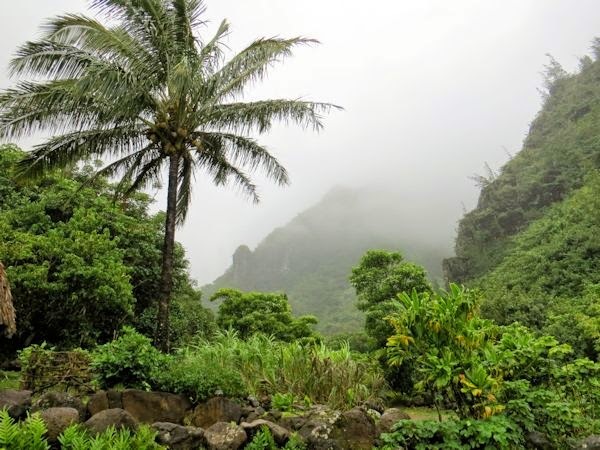 Visiting the Limahuli Gardens was like a journey back in time to a natural undisturbed rainforest with native plantings, a view of the misty mountains above and Pacific Ocean below...a majestic view that will take your breath away...an experience I will always remember. Linking to Today's Flowers and Our World Tuesday.